I think I finally understand Pac-Man. I mean, the little fella eats all the time. His entire existence is eating. Over here, he eats a row of pellets. Over there, he’s chomping on some fruit. After that? Why not wash it down with some nice, tasty ghosts. And I think I finally know how he can eat that much and not get pac-diabetes. This little yellow guy moves. He might be eating with every step he takes, but he needs to. Running that much takes a lot of energy, which means Pac-Man needs to constantly refuel. Otherwise, he would crash and those ghosts would be dragging him into the netherworld. And who can have that when running for a PR–err, high score. Last week, I was running 5-6 miles per session, and I was okay. I was hungry, but I’d eat, and I’d feel satisfied. This week, I upped my mileage, and at the 7.5 mile marker, I found a new and magnificent level of hunger. I want to eat all the time. So I eat, and an hour later, I’m hungry again. So I eat again. And a couple hours after that, I’m hungry again. So I eat. And in my mind, I can’t help but see this level of hunger as a terrible thing. I mean, I know I need the fuel, but I have spent the past three years in weight-loss mode. I’ve spent so much time and energy learning how to control what I eat, understanding the calories and nutrients in everything that went in my mouth, and trying to make sure that I keep burning more calories than I take in. Every day. For three years. And now, I’m being told by Runkeeper that my morning runs–at my height, current weight, and average page–are burning around 1,000 calories. At this point, approximately 80-90% of my total daily calorie intake. That completely throws everything I know and that I’m used to right out the window. I do the only thing I can: I listen to my body. It’s telling me that to eat, so I eat. And you know what? I’m still losing weight–which may actually mean I’m not eating enough. But since I still have about 10-15 pounds to go, I’m going to just roll with it. I’m going to eat when I’m hungry. I’m going to eat to fuel my runs. I’m going to run because it makes me healthy and fit (not to mention that I love it–most of the time). And that’s exactly what I recommend for you: eat when you’re hungry. It’s your body telling you something. 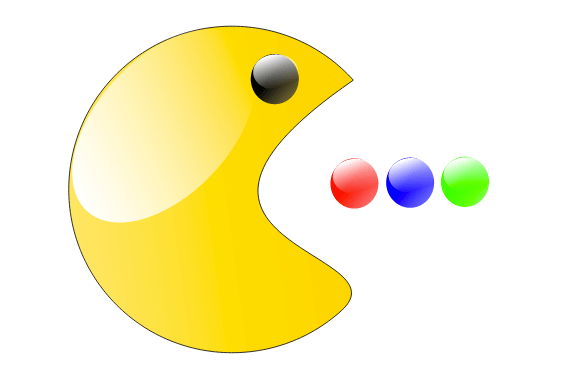 That doesn’t mean that you get to go Pac-Man wild if you’re not as active as the little yellow bugger, but even if you’re in the middle of a weight loss regimen, there is absolutely no reason for you to be hungry. What’s really awesome about this coming up is that I’m learning. I’m still learning what makes my body work, and I’m learning how to make this a sustainable lifestyle. It’s been three years since I started, and every few months, something changes to make me rethink everything I think I know about myself. I mean, I am still learning how to run (and to eat) for fitness as opposed to running and eating for weight loss. Is that scary? Yeah, it really is. But it’s not any more scary than being chased around the track by ghosts. Ain’t that right, Pac-Man? What are your thoughts on the balance between fueling for fitness and for weight loss? I can see how that can be scary for you. However, look at it this way. Those 1000 calories that you eat, then burn? Don’t count. They’re gone. If you don’t replace them, you won’t be able to run and you’ll get very sick. Have you tried using MyFitnessPal? I don’t count calories but it’s a great app where you can plug in your foods, your exercise, height, weight, etc, and then it makes the calculations so you can eat the right calories for what you, personally are doing. Not sure if that’s how RunKeeper works, but maybe a thought that would make you feel a little better about eating more. That’s how I look at it. I can’t look at it as weight loss anymore. It’s just a really hard transition because I constantly feel in the back of my mind that I’m overeating, even though I know consciously that I’m not. And I did use MyFitnessPal last year. It really, really helped keep me on track to start running and stay fueled while being more active. It was actually my primary tool to learn what my daily caloric intake was. I did it long enough for that I can pretty much keep up with it as I go, and if something new is added into my diet, I tend to look it up and know what I’m adding in. I lost a good chunk of weight over the last year and had a really hard time when I started having to fuel for runs — seemed so counterproductive to eat while I was trying to burn calories. I wound up cranky and tired, all the time though. I try to listen to my body now and I just feel SO much better. I know that as long as I continue to stay active and make mostly healthy choices in what I’m eating, that I’ll be able to maintain and even lose a few pounds. That’s really where I am right now, too. I figure as I move into half-marathon and marathon training that I will just adjust to the activity and lose weight (or at least get fitter and more trim) regardless. The way I see it, if I’m pushing 20+ miles a week, I’ll lose the excess weight eventually. Running isn’t a free pass, I know, but it’s certainly a big boost. If you look at toddlers that follow their hunger signs (i.e. that haven’t been forced to eat more than they want to when they were bottle- or spoon-fed), you’ll notice that they can eat like ogres at some meals and eat just a few bites at others. In the same vein, if you are hungry, eat. More importantly for those of us who grew up under the “Finish your plate, little Africans in Ethiopia are going hungry!” type of blackmail must also remember to stop eating when we’re not hungry anymore. I’ve taken to ordering the “baby” size ice cream cones when we go out for a treat. Mostly because I’m not that hungry at this point but do want the taste of ice cream. “Baby” size is enough to get the taste and feel of ice cream without feeling overstuffed. And you know what? It was every bit as enjoyable as the gigantic bowl, and it was entirely guilt free. Score! There are days when sometimes all I want to do is eat. It happens. I too use myfitnesspal I however use it more now out of habit. I’m at my goal/set point weight, so I just pretty much maintain. I do use it to keep my maco’s in check. I find if I have too many ‘wheat’ carbs I feel gross. Eating more protein has been a big help for me, and instead of carb loading, I fat load. Works for me. So maybe fiddle around with your macro’s, increase your protein and decrease the carbs. That helped a lot for me, too. Seeing that I was eating so much processed stuff with sodium was my big moment. I realized that made me feel just heavy and gross, and I was able to use MyFitnessPal to focus in on it.